Welcome to another week on Myss Lafunky's blog. Thank you to those that followed our last series on sexual purity and those that took their time to send us messages about the series. 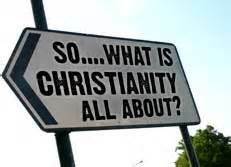 For the next few weeks, Myss Lafunky and her team will be sharing different accounts of what Christianity has taught various Christians; interviews will be conducted and their responses will be shared on the blog. Want to participate in this? Kindly send an email to trulymakingadifference@gmail.com to notify us of your interest. A Christian is a person who has encountered the love of God as a direct result of putting their faith in Jesus Christ and His death on the cross on their behalf. Such an experience brings the person into a relationship of loving obedience. To develop their relationship with Jesus Christ, Christians pray, read and reflect on the Bible, worship, meet with other Christians, and then seek to live their lives in the light of the Bible. Christians believe that Jesus Christ is God and in order to have a relationship with God, you have to go through Jesus Christ. Jesus says, “I and the Father are one” (John 10:30); “If you knew me, you would know the Father also” (John 8:19); “He who has seen me has seen the Father” (John 14:8); and “I am in the Father and the Father is in me” (John 14:10). Who then is Jesus Christ? from the beginning (John 1-1:3). He is God. On earth there was a need that could only be accomplished by God Himself. Man was separated from God because of sin. (Sin is when people do bad things; like kill, steal, cheat, lie, and hate; etc). So God became flesh and came down to earth as Jesus Christ (John 1:14). This is very mysterious for the human minds to comprehend. So Jesus Christ willingly left the beauty and joy of heaven to be born and in time died on the cross so mankind (every man, woman, boy and girl) could be forgiven from sin. on the cross. This was the only way mankind could be forgiven and brought back into a relationship with a holy God. Jesus Christ is the only God that is not dead, He is alive in heaven and through His Holy Spirit, He lives insides and guides everyone that believes in Him and has chosen to follow His teachings. I can't wait to find out what Christianity has taught those that follow the Christian faith. Watch out for the series as we kick off from next week Monday.